Fake Smiles is a graceful, moving and reflective memoir of a contentious father-son relationship set against the backdrop of the Eisenhower and Nixon eras. The father—William P. Rogers—was attorney general in the Eisenhower administration and secretary of state in the Nixon administration, a period of dramatic change from post-war stability to the turmoil of the sixties. 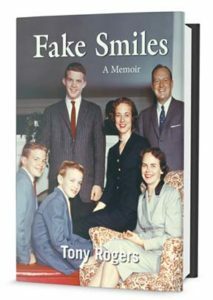 The author—Tony Rogers—the shy, introspective oldest son of the Rogers family marched against the Vietnam War while his dad was heading the State Department, played guitar in rock and jazz bands, built ham radios, spent two summers working on farms and had no appetite to “get ahead” which was his hard-driving and competitive father’s constant mantra. Gradually and with great difficulty, father and son learned to accept each other. An uncommonly literate, personal history Fake Smiles reveals fresh insights into a pivotal era of contemporary American history. Tony Rogers describes the political, personal, and psychological challenges of growing up in the sixties with a powerful establishment father … a moving and very memorable tale, one that can help all of us better understand the issues of family, country, and finding your way. A great story of a father and a son and their relationship at a difficult time for the nation and for family life in general as mores and habits were changing. The book is a pleasure to read and it stays with you for a very long time. Full of fascinating encounters — Robert Frost was a visitor, Senator Joseph McCarthy tried to teach Tony boxing — but above all a deeply moving account of the awkward competition and affection between father and son during an extraordinary era in America. Tony, I saw your book in a bookstore in Cambridge last wk and bought it. read it on a work flight from LAX to JFK last night and thought it was terrific!